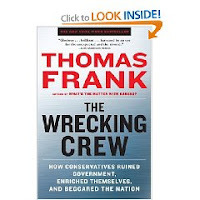 The recommended book is The Wrecking Crew by Thomas Frank, definitely a most hated book by Conservatives. Frank lays out the seeds of destruction of our democracy and in light of the latest decision by the Supreme Court in support of unlimited corporate financing in support of political campaigns it is a poignant reminder of how fragile our democracy is. The corporate elite will move us from a representative democracy to a corporate fascist state while all the time using the pro conservative media to brain wash the American people that it is in their own self interest. Any criticism will be labeled socialistic or liberalism and un-American meanwhile the corporations will be buying and paying for the best government their money can buy and that government will do their bidding. The American people will have lost their government. This is a most important book and it should be a wake up call to the danger that exists and a call to arms for the American people to be aware of whom they choose to represent them. The election in 2010 might very well be the last truly free election in America. "Following up on his masterly examination of the paradox under which Red Staters consistently vote Republican against their own economic self-interest (WHAT'S THE MATTER WITH KANSAS? ), Thomas Frank sets out to trace the present-day conservative Republican approach to government in THE WRECKING CREW. What he demonstrates is deeply disturbing even though it has remained on display virtually every day of the entire Bush II administration. There is little good news in THE WRECKING CREW. Author Frank shows that our national government has been hollowed out under Republican conservative control, savaged into an ineffectual husk. Furthermore, he illustrates clearly that this was no mistake, that it is part of a deliberate process not just to privatize government and eradicate government regulation but to make these changes permanent by destroying the liberal left (and with it, of course, the Democratic Party). Frank demonstrates well that present day politics has truly become, to invert von Clausiwitz's famous maxim, "a continuation of war by other means." Regrettably, one side of the battle continues to play the game as politics, as elections won or lost and citizens swayed or not, while the other side approaches it as an act of war, a no-holds-barred contest in which the only goal is the complete and utter destruction of the other side. THE WRECKING CREW is compelling and informative even as it paints a bleak picture of an America being driven rightward and increasingly toward the excesses and inequities of the pre-New Deal era. We all know how that era ended in October, 1929."